MarTech Peaking? Don’t Count On It! I spent time at MarTech West the other week listening to keynote speakers and visiting all 80 of the exhibitors at the show. I talked with each of these exhibitors to learn directly from them about the trends and challenges and opportunities they are facing – as well as the challenges facing marketers in this space. 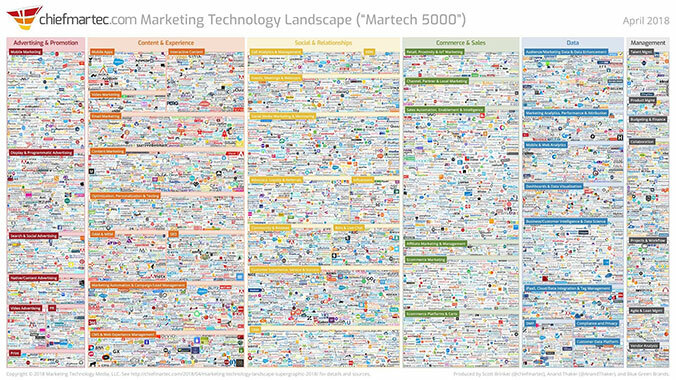 While the growth of broader-reaching MarTech solutions has slowed (only up +3% in 2019 versus 2018), there are still 7,040 MarTech solutions available to marketers and marketing agencies. In 2011, there were barely 150 firms. What this conference revealed to me (and my recent study of the space has revealed to me) is that there are a number of things that Marketing Agencies need to be aware of as they work to stay current and move their own business and their clients’ businesses forward. Marketers like McDonald’s are buying MarTech companies and turning themselves into technology-driven marketers. McDonald’s recent purchase of Dynamic Yield puts into their hands the ability to customize and better personalize the experience for their customers. So instead of hiring an agency to optimize that part of their business, they are bringing the expertise right in-house. -52% of marketers state that integration of different MarTech platforms is limiting to their success. -56% of organizations report under-utilizing their MarTech stack. 21% have bought and don’t use what they buy. -Only 9% of companies surveyed state they they fully use their full-on stack. While I don’t expect Marketing Agencies to become MarTech stack consultants, being knowledgeable about platforms and helping save your marketing partner from the pains of limited utilization can go a long way in building a solid long-term partnership. There are a growing number of no code/low code tools being dropped into the market today. There are now open APIs that allow users to extend usage and create customization much easier than ever before. So don’t assume that your Marketing partner automatically needs you to build platforms to enhance their business…as they can now do it on their own. Lastly, there’s the coming of “ecosystem specific MarTech” and niche vertical solutions for industries. So while the growth of broad-reaching MarTech tools is slowing, the number of platforms that address specific niches in specific industries are growing. Products like loyalty platforms specifically designed for the dental industry and CRM platforms tailored to religious communities are examples of where companies are carving out homes in areas that were once dominated by agencies. The bottom line is: Marketing Agencies need to know what’s out there and know what’s happening in and around the MarTech world. Clients will demand it if they aren’t already. If you operate in a particular vertical, know what’s being developed so you can be the firm that brings the ideas to your clients (possibly as a white label), versus having a MarTech firm beat you to the punch and carve out parts of your business. Next week we’ll talk about some of the more interesting tools I unearthed at MarTech West earlier this month. https://www.agencynewbusiness.com/wp-content/uploads/2019/04/MarTech-to-Host-Great-Line-Up-of-CMOs-and-Visionary-Marketers-October-2-4.png 445 769 Mark Sneider https://www.agencynewbusiness.com/wp-content/uploads/2018/08/Updated-RSW-logo-2018-small.png Mark Sneider2019-04-17 20:49:312019-04-18 14:06:32MarTech Peaking? Don't Count On It! The Droga5 Purchase – What Does It Mean for Your Agency? The agency world saw a huge acquisition earlier this week, as Accenture purchased creative firm Droga5. What are the implications of the $200+ million move, and how does it change the landscape for marketers looking to make the most of their agency relationship? While the news may not directly impact your agency, it serves as a bellwether for what to expect as change continues to make its way through the market. It also serves as an encouraging reminder of the value of creativity in a space that had increasingly become just another line item in the eyes of procurement. The partnership represents the intersection of creative work and digital business transformation that marketing has become. Accenture Interactive has an abundance of resources, but the move to bring on Droga5 shows that creativity remains the crucial “X-factor” in moving the needle. Looking at the move through the lens of your own client relationships, you should be providing clients with an infusion of creativity while also demonstrating the impact of your investment. Accenture isn’t the only holding company looking to tap into outside creativity: the Droga5 acquisition runs parallel to a move from Diageo to review its advertising lineup. In the face of transformation and upheaval within the big global holding companies, brands are increasingly looking to independents to deliver more courageous creative. Right or wrong, there’s a perception in the agency world that consultancies are the stuffy, buttoned-up type, while creative shops tend to be more bold and free-spirited; in light of the latest moves, it appears that there’s room for both in an effective marketing agency, and that a happy medium may be what you need to deliver both concrete results and fresh ideas. So at the end of the day, what are you, the agency, to take away from the Accenture-Droga5 move? https://www.agencynewbusiness.com/wp-content/uploads/2019/04/The-Droga5-Purchase-–-What-Does-It-Mean-for-Your-Agency.jpg 590 498 Steve Taggart https://www.agencynewbusiness.com/wp-content/uploads/2018/08/Updated-RSW-logo-2018-small.png Steve Taggart2019-04-05 10:27:422019-04-05 10:28:00The Droga5 Purchase – What Does It Mean for Your Agency? 2017 is shaping up to be a pretty decent year…comparatively. In 2014, the enthusiasm for agency new business hit a low of 19%. Only 19% of agencies believed that the year had brought them more opportunities than the previous year. In 2016, the enthusiasm meter ticked up quite a bit. 31% of all agencies that year, felt positive about the year they had just closed out. In this year’s survey, the number continues to rise, with 37% of all agencies feeling like the agency new business landscape was very giving in 2017…and they believe the outlook is equally as positive for their firm. 54% of agencies expect next year to look even better. I suspect a few things are going on. One is the economy. Agencies tell us their existing clients are spending more in part because they feel better about the economic direction of the country. Possibly a cumulative effect over the years or possibly just the effects of an all-Republican hold on government, which continues to suggest positive signs for big business. Like it or not, it’s the reality of the situation. The other is project focus. More and more marketers are pushing out project work as a way of “sampling” agencies. With more project work comes more projects and more agencies opening up more doors into marketers. If your agency is anything like the agencies we represent, oftentimes once you get in the door, you can prove out your value. And the final thing is stability in number of agencies. In years past, we’ve seen marketers contract the number of firms they work with. In other years they expand. This year, we see relative stability in the expected behavior of marketers, with 69% of them indicating they will keep the number of firms they use the same as they did in 2017. So what does this all mean for you, the agency? Despite all this enthusiasm, agencies are still finding it pretty tough to mine for new business. 43% of agencies say it was tougher to find new business in large part because it’s tougher to break through. So while the opportunities are out there – and agencies are seeing the fruits of the giving market, all this enthusiasm doesn’t mean you can sit idly by and wait for the door bell to ring. With referrals on the decline, with more agencies hunting for new business, with fewer marketers moving from job to job (because there are less of them), pushing forward with a strategically well orchestrated new business plan is key. So keep your name out there. Start treating your brand like a client. Look at your social program and ask yourself if it really “rates”. Look at your website and does it work as hard as it can to “sell” your agency…easily. And think about what you’re doing to be present in front of the marketers you want to win that project from. Because one thing is for certain…if you don’t keep your name out there and you don’t organize your new business face, there are 5 other agencies in Fort Wayne, or Cincinnati, or Los Angeles, or New York that are doing it for themselves. RSW/US Survey: Is the Advertising Industry Adapting Well to the Modern World? Good news, Agencies!! Marketers say yes. This is an upbeat finding of the RSW/US 2016 Agency New Business Survey Report: marketers generally see the advertising industry adapting well to the “modern world”. Our recent post, If our Agency new Business Survey was a Fortune Cookie… related that when asked how the industry is adapting to the modern world, marketer responses show they feel good about agencies’ preparedness. Without discounting the effects and implications of new marketing technology, new media channels, changes in consumer media consumption habits and more, it’s worth taking a deep breath and looking at what Marketers say brings them the most benefit through their agency relationships. If you are feeling the turbulence of industry change like weather fronts colliding, you have plenty of company. It is certainly important to instill a process of studying industry changes and a culture of adapting and adopting the ones that are vital to your business and your clients’ objectives. Recently new titles such as “Chief Marketing Technologist’ and functions such as “marketing technologies” and “data scientists” (Forbes: The Top 10 Trends Driving Marketing in 2017) will have bearing on your work and relationship with clients, as well as implications for agency new business opportunities. And, keep on delivering those benefits Marketers say they value most: creative, innovation, strategy. If the RSW/US 2016 Agency New Business Survey Report was a fortune cookie, it would foretell of an industry increasing in complexity, yet full of opportunity. The RSW/US Agency New Business Survey is one we field every two years that examines the state of…well…Agency New Business Development. The 2016 Survey was the fourth in the series so far, and to observe changes and trends, it included several standard questions posed to almost 5,000 agencies and marketing services executives across the country. This year’s survey added a couple questions in relation to the potential of technology and the readiness of the advertising industry for the future. These particular questions were also presented to marketers, with over 10,000 marketing decision makers invited to participate. 2. 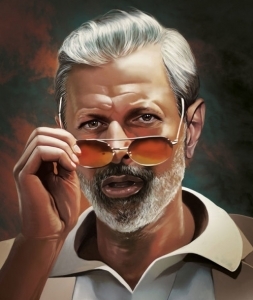 Is the Advertising Industry adapting well to the modern world? Responses to each show marketers seeming to be a bit more bullish in each area. No doubt, the industry is growing in complexity. And there’s little doubt the pace of change will slow. The good news is marketers need expertise from agency partners and they want agencies to lead. In the flurry of pressing deadlines, staying on the cutting edge is challenging. Still, it’s necessary. In 2017 – and beyond – commit yourself and your firm to studying emerging trends and learning to adapt to – or even have a hand in shaping – the ones that will truly be driving your clients’ businesses. Importantly, be brave and bold in leading your clients through this ever-changing territory of advertising and marketing. Embrace that fortune cookie! We’ve just released the 2016 RSW/US Agency New Business Survey Report. This is a survey we conduct every two years; 2016 presents our fourth report in the survey series. The primary objective of the Agency New Business Survey is hearing from agencies about the new business environment, and how industry changes have been affecting the new business process. The 2016 RSW/US Agency New Business Survey Report shares not only 2016 agency feedback, but compares it to the results of prior years. In 2016, ADWEEK provided some questions to include in our survey. These questions were provocative for both Agencies and Marketers, AND feedback to the questions also presented implications for agencies in considering new business issues. Therefore, we surveyed Marketers on the ADWEEK questions as well. NBD tenure at agencies remains stuck at 2 years or less (as in 2014). 79% of agencies responding say their NBD has been/was on staff less than 2 years. Lack of a new business methodology is the #1 reason for lack of new business success. It’s been the #1 reason for all four surveys since 2010. This year 48% of respondents identified it as the #1 reason. Agencies need to adjust, as AORs are no longer a given right out of the block. 46% of agencies report an increase in project work. 61% of agencies state that they are finding that they have to collaborate with in-house agencies. Marketers and agencies see the world differently when it comes to Virtual Reality. 63% of marketers think it’s a “revolutionary technology”. Only 43% of their agency counterparts feel the same way. Marketers feel agencies are adapting well to the modern world. Agencies don’t give themselves the same credit. 67% of marketers feel that the Advertising Industry is Adapting Well to the Modern World. Agencies are a lot tougher on themselves! Only 46% of agencies feel that way! Marketers value creative over any other benefit agencies bring to the table. 96% of marketers say “Creative Expertise” is the primary benefit an ad agency brings to its clients. Strategy and Innovation are tied for #2. In an attribute rating of eight social media channels, Google+ has a profile no marketer would want their brand to have! It’s perceived more so than any other social platform as “declining”, “pointless”, and “boring”. And, perhaps it’s no surprise after this election that Twitter is the “most hostile” of any of the social platforms in the market today. See the 2016 RSW/US Agency New Business Survey Report insights on additional questions and further detail behind these highlights. You can download the report free from our website. Could a Robot Be Your Next Intern? If a robot COULD take on some of your tasks as your next intern, think of the time you could free up for new business development! When it comes to Artificial intelligence I find there are two schools of thought. The first, a hostile takeover in which machines threaten our everyday way of life, and the second being an innovation “utopia” where man and machine live harmoniously. For years these ideas only existed in our favorite movies and books, but what would it look like if AI made its way into our everyday lives? For marketers, this “future” is now. Many emerging technologies are inventing ways to rid those very mundane tasks from our everyday and hand to reins over to AI. Take this blog, for instance. I’ve spent time (too much in fact) formulating my ideas, drafting, editing, and reviewing. All this is on top of my other responsibilities, and so I’m forced to “create” in a limited capacity. However, through the use of AI and natural language technology I could simply plug in the a few parameters and BOOM a perfectly written, meaningful narrative for my intended audience. This comes off threatening to many of you, and I get it, but at the end of the day wouldn’t you rather spend your time crafting a new strategy, taking that design just a bit farther or making contact with new business prospects? That’s the space where AI lives. It’s not out for your job, but rather to act as your most prized intern, delivering everything to you perfectly the first time, on time. Technology like this gives us back our most precious commodity, time. However, like a dog on a leash, AI can only take us so far. The rest is up to us. We have the freedom to be more creative, and with that power we can begin to shift our product offering from operational to ideological, where the true value lies, that no machine can replicate. The challenge is, if we get to this point will we be able to fill the space appropriately? Or has routine stunted our potential? So, what would you do with an extra bit of time? https://www.agencynewbusiness.com/wp-content/uploads/2016/11/man-and-machine-feature.jpg 1080 1920 allie https://www.agencynewbusiness.com/wp-content/uploads/2018/08/Updated-RSW-logo-2018-small.png allie2016-11-02 19:02:542016-11-02 19:02:54Could a Robot Be Your Next Intern? Jay Baer of Convince and Convert: Account-Based Marketing –What’s in it for Agency New Business? Our 2016 Thought Leader Survey presented questions from six industry Thought Leaders about current developments and trends in the industry. Each panelist also offered a piece of agency new business advice. Best-selling author and consultant, Jay Baer is one of the contributors to the survey. Jay’s blog, Convince and Convert, is the #1 content marketing blog in the world, and he is the author of the New York Times best seller, Youtility: Why Smart Marketing is about Help Not Hype. For our Thought Leader Survey, Jay provided several questions about blogging and content development. Certainly, the agency respondents’ feedback to these questions is interesting and insightful; I hope you read the report for the results and perspectives on those questions. This was a question that was really new amongst our Thought Leader Surveys, a fact reinforced by 46.2% of responding agencies choosing the response, “Tell me more about account-based marketing”. The concept of Account Based Marketing deserves far more attention than a single blog post following up on the survey. Still, just as a starting point to address the “tell me more” response, what Jay is considering when he talks about Account-Based Marketing Principles is a new business approach that targets and pursues an organization as a whole from a prospecting standpoint, versus simply a Marketing Director or the CMO; that is, courting the organization as a desired client rather than just particular individuals within it. This concept poses fresh considerations across the spectrum of agency new business strategies and tactics. What does it mean for defining your prospects? How does this impact how you position your agency with respect to the desired organization? What are the implications in communicating to an organization versus an individual or several individuals within it? How does this impact our content strategy? Do we develop posts for specific organizations? The implications go on, and they are pretty profound. We are here at RSW/US to help our clients on that path. https://www.agencynewbusiness.com/wp-content/uploads/2016/02/jay-baer-photo-60-2.jpg 307 307 Mark Sneider https://www.agencynewbusiness.com/wp-content/uploads/2018/08/Updated-RSW-logo-2018-small.png Mark Sneider2016-02-04 12:55:492017-02-17 14:40:33Jay Baer of Convince and Convert: Account-Based Marketing –What’s in it for Agency New Business? Have I Got a Project for You! To project or not to project? Turn the clock back to 2005 when I started RSW/US and agencies could be much more discriminating. They didn’t have to accept project work, they could be more selective relative to their client base, and if you were a big networked agency, you could dismiss small potato marketing clients. In our most recent survey, 52% of marketers said that up to 40% of the work they assigned to agencies in 2015 was project work. 40% of marketers anticipate that the amount of project work they will assign will increase in 2016. 77% of agencies said that 60% of their work in 2015 came to them via project work. Each and every year, we have seen more of our agency clients win more business – most of which is project based…that often leads to larger assignments within the organization. There are the occasional AOR assignments, but they are fewer in numbers than they were in 2005. There are a number of reasons why project work has increased and will continue to increase as we move throughout the coming years. So what does this mean for you, the agency? Means you can still be selective (only going after project business if you think there’s some real potential down the road)…but means you have to accept project work. Means you need to get more aggressive in finding work, because there are fewer marketers that can carry you from job to job…and more agencies getting more aggressive in their attempts to find new business. Means you need to accept what might be lower margin project business to win it big down the road with the same client. Means you need to better define your point of difference as an agency to help marketers more clearly see why they should select you over the hundreds of agencies trying to win the hearts and minds of the same marketers you want on your roster. And in defining your positioning, you need to build the marketing platforms around it to support a solid inbound marketing program that defines your thinking, your positioning, and your expertise. https://www.agencynewbusiness.com/wp-content/uploads/2016/01/art-projects-for-kids-1024x855.jpg 855 1024 Mark Sneider https://www.agencynewbusiness.com/wp-content/uploads/2018/08/Updated-RSW-logo-2018-small.png Mark Sneider2016-01-29 03:00:292016-01-29 03:00:29Have I Got a Project for You! What’s Your Agency’s Bumper Sticker? Ever put a bumper sticker on your car? I have – usually during political election seasons. Bumper stickers typically very clearly and very succinctly articulate an idea or a position. If you had to create a bumper sticker for your agency, what would it say? How would it define your point of difference in a way that is compelling enough to get marketers to want to sit down and talk with you? If you tell me your bumper sticker says that you’re strategic or hard working or a dedicated partner, I will simply cry. I’ve told this story before…but I’ll tell it again – to make my point. Back in 2007, I presented to a group of 20 agency principals. During that presentation, I asked them to outline their elevator pitch. 19 of the 20 agencies told me that what made them different, was the fact that they were strategic and fun to work with and hard working. While all of this is great and each and every agency needs to do all of these things, these aren’t the things that are going to attract a new marketing client when you’re reaching out to them. They are things that will help you keep your relationship strong and help your marketing clients feel like every day is the first day of the relationship. In our annual surveys among marketers, we know that it’s these things (when they are not delivered) that cause marketers to look for a new firm. So how do you define your bumper? While it’s certainly possible that your positioning won’t fit on one bumper sticker…it may need two or three…but regardless, it still should be tight and clear and unique to who you are. Think about where your strengths are. Are they sector specific? Do you have an expertise in a specific type of work? Is the there a commonality in the types of problems that you solve for clients? Is there a similarity in the types of clients you represent (in size or market position)? Do you have technical expertise in a specific area? Are you so tapped into an industry, gathering up insights from some pretty unique sources that put you in a position that proves advantageous versus other agencies? These are the kinds of questions you need to ask yourself – or the kinds of questions you need to ask your clients. Once you define it, live it, breath it, carry it across everything you do. Put it on a bumper sticker and bring it to life! https://www.agencynewbusiness.com/wp-content/uploads/2015/10/too-many-bumper-stickers-3.jpg 1200 1600 Mark Sneider https://www.agencynewbusiness.com/wp-content/uploads/2018/08/Updated-RSW-logo-2018-small.png Mark Sneider2015-10-29 01:47:112015-10-29 01:47:11What's Your Agency's Bumper Sticker?